The process is recursive, so all subfolders are processed too. 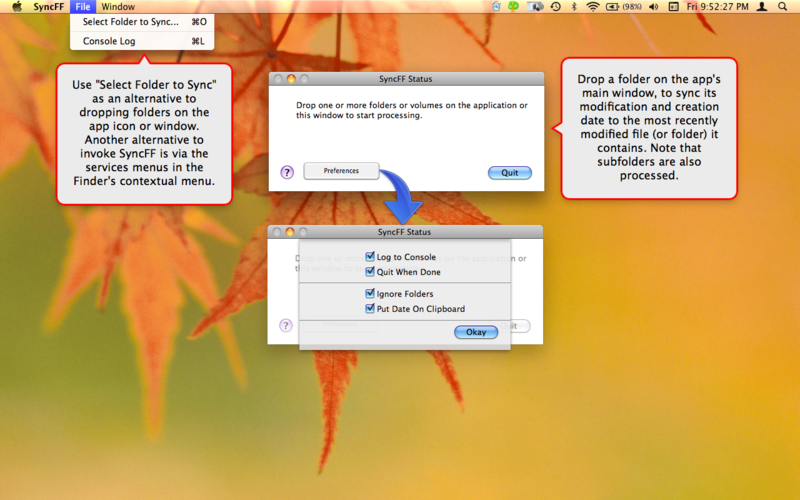 To use SyncFF just drop a folder on it or the main status window. Alternatively you can use the File menu item "Select Folder To Sync…" or the service menu items "Sync Folder's Dates To Last Modified File." The main status window displays progress of processing. You can also see a log of all the messages that go to the status window by selecting "Console Log" from the File menu. Click the "Preferences" button to specify options. • Log to Console: If selected progress messages are written to the console log which can be view in "Console.app" by selecting "Console Log" in the File menu. This log is strored in ~/Library/Application Support/Limit Point Software/SyncFF. • Quit When Done: Terminate the program upon completion. • Ignore Folders: If selected folder modfication dates are ignored, i.e. only files are considered when syncing folders with their contents. • Put Date On Clipboard: If selected the most recent modification date of the last folder processed will be placed on the clipboard.